ArcGIS extension radically simplifies the cross-sectioning process. Detailed multisurface views can be created quickly and easily. GIS saves costs, aids creation of maps. In the field of geoscience, having accurate views of the earth's subsurface is critical. Unfortunately, generating cross-sectional perspectives of the earth's crust is a complicated affair. One cannot simply slice into the earth as if it were an onion to view its layers. Because the complexity of creating cross sections entails the use of multiple applications, potentially by multiple workers, BGC Engineering Inc., an applied earth sciences firm in British Columbia, Canada, sought a better way to obtain the views it needed without the fiscal waste and potential for error usually associated with the procedure. BGC can quickly generate cross sections that illustrate candidate mine tailings and dam locations. These candidate cross sections illustrate both the "starter" and "final" dam alignments. With more than 100 experienced professional engineers, engineering geologists, hydrogeologists, and technicians on staff, BGC specializes in providing consulting services to mining, transportation, and natural resource sectors. As such, creating accurate representations of subsurface terrain for its clients is essential to building better and safer pipeline systems. Given the importance of delivering such imagery, engineers at the firm spend a good portion of their time creating cross sections. A best practice for viewing multiple surfaces simultaneously, the cross section is a simple way to visually convey surface and subsurface information to engineers instantly. For example, terrain analysis for pipeline design and construction often delivers critical information about soil and rock type; depth of pipe below stream crossings; and steep, potentially unstable slopes. This kind of spatial information is best delivered to the client in one visual presentation displaying many surfaces at once. Until recently, geomatics staff at BGC used a variety of applications to create the subsurface imagery their clients required. In addition, engineers and geoscientists at the company often had to rely on CAD specialists to create and edit the diagrams, which entailed going back and forth to edit scale, labels, and other details. After one of BGC's analysts saw an ad for CrossView, a cross-sectioning plug-in for ArcGIS, BGC decided to try the software. 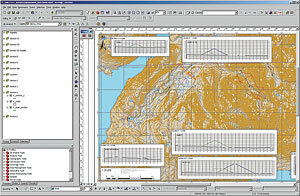 Created by A-Prime Software, a Denver, Colorado, GIS software company, CrossView is an extension to ArcGIS that simplifies the cross-sectioning process, allowing users to complete the entire procedure on a single desktop. Instead of having to exit the ArcGIS environment to create subsurface views, CrossView enables GIS specialists, engineers, geologists, and construction developers to handle every aspect of the process within ArcGIS itself, eliminating the need to outsource the task to a CAD technician. For a department already familiar with the ArcGIS platform, this seemed the ideal solution. A GIS analyst for BGC, Matthew Buchanan spends most of his time creating maps and analyzing data for engineering clients, as well as determining dam fill and basin storage capacity using 3D analysis. 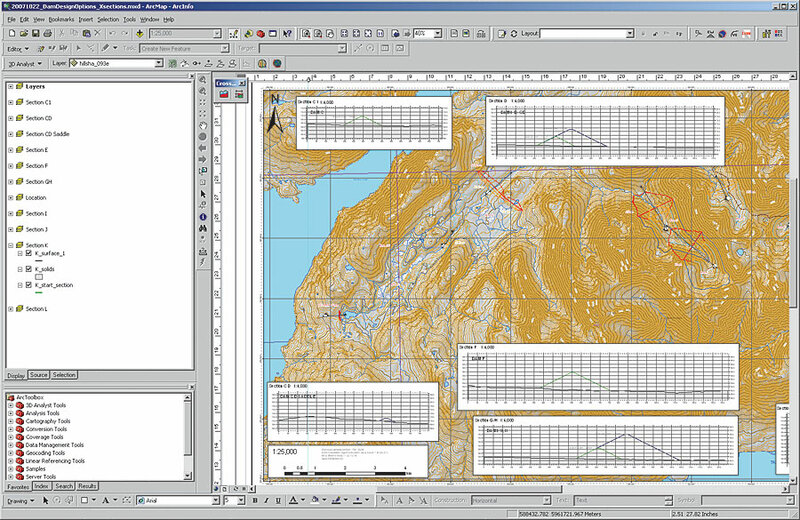 Generating multisurface imagery is key to these tasks but was more labor-intensive than it seemingly needed to be. 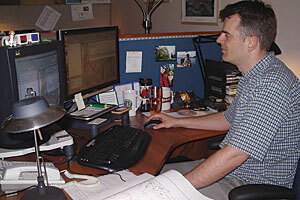 Matthew Buchanan, senior GIS analyst, at his workstation. "Cross-sectioning the old way was akin to buying a Ferrari and hiring a chauffeur just to drive to the corner market once a week," says Buchanan. "In one project, I had to create a series of different dam alignment scenarios including cross-section imagery. Although CAD technicians were able to create functional diagrams for me, it was obvious there was a more expedient way to create these images within the ArcGIS platform itself without the assistance of cumbersome software and outsourcing." The extension was able to help Buchanan create detailed multisurface views more quickly and easily within a familiar workflow. This tool helps save clients money. The integration of cross-sectioning in a GIS environment has not only enabled BGC to create cross sections in record time but has also reminded BGC staff of the enormous potential of GIS in solving complex problems. Says Buchanan, "When engineers see the capabilities and cost savings of using GIS software to create professional-looking cross sections and plan maps, they will want to use GIS more often." For more information, contact Matthew Buchanan, senior GIS analyst/programmer, BGC Engineering Inc. (tel. : 604-684-5900, ext. 147; e-mail: mbuchanan@bgcengineering.ca), or Matt Gale, A-Prime Software product manager (e-mail: matt.gale@aprimesoftware.com, tel. : 877-627-3696, Web: www.aprimesoftware.com).